We almost always have a camera on us when we are out and about now, with most of us having a mobile phone, and most of those phones having a camera. It's easy then to take a 'snap' of a lovely or memorable scene as you come across it, or is it? Although many smart phones have very capable cameras these days, and a host of 'intelligent' automatic features that are supposed to make it far easier to take a 'perfect' photograph, there are still conditions where even a powerful smart phone computer/software/camera combination can produce a poor quality photo. Bright sunlight can even cause problems for professional level DSLR cameras when set on 'automatic' modes. The problem is that, although it depends on exactly how you have your 'automatic' mode set up, in many cases the camera is either going to try and achieve a 'balanced' exposure for the scene as a whole, or else try and 'expose' for the area of interest you are indicating through the active 'focus point'. In either case, on a bright day, this can cause problems that lead to an image that is either too bright or dark overall, or where the subject/area of interest is over exposed or under exposed depending on where exactly the camera is 'metering' from. A camera, whether it is a traditional 'film' camera or a digital camera essentially converts light into an image, either through a chemical reaction or an electrical reaction but even traditional film cameras use an electronic system for 'metering', that is measuring the amount of light in different areas of a scene to decide on the appropriate exposure settings. The metering 'sensor' consists of one or more light sensitive receptors which generate an electrical signal proportional to the amount of light falling on the receptor. A handheld light meter might have a single receptor so can only measure the total amount of light falling on that receptor, but a modern metering sensor is almost as complex as the imaging sensor in a camera, consisting of thousands of individual receptors which mean the sensor can measure the light in different areas of a scene. The camera will then perform some processing to come up with an exposure setting on the basis of some measure of the 'average' amount of light in the scene. This might be on the basis of the centre area of the scene, the whole scene, or a spot point in the scene depending on the settings. Of course you don't need to be aware of any of this in order to take a photo, you just point your camera and 'click' but being aware of what the camera is doing can help get the best out of what can be tricky conditions. 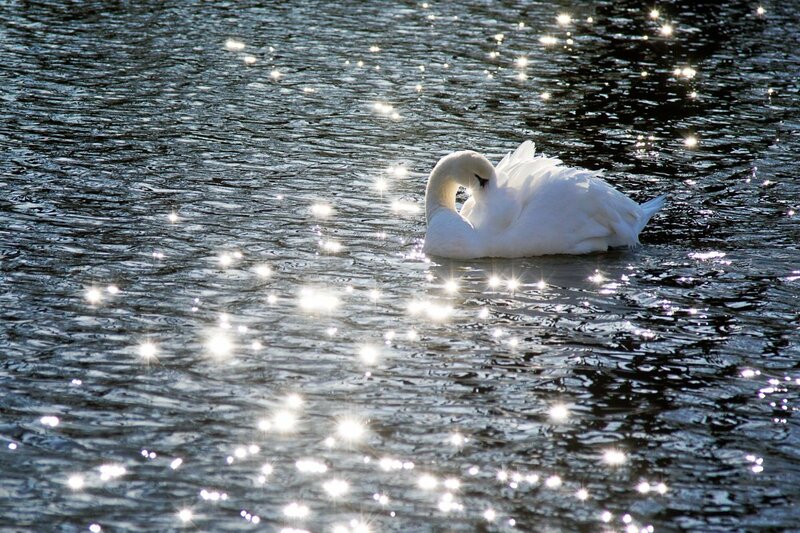 If we consider this scene of a white swan on a river in bright sunlight, with the sun glistening and reflecting off the water. Typically, automatic metering would result in the camera 'seeing' this as a very bright scene and the exposure would be set to reduce the amount of light reaching the sensor. This would result in an underexposed image which would be darker than wanted, putting the swan's body into shadow. If you were aware of this, and focused/metered from a darker part of the scene to 'compensate' then the resulting image would be too light and you would lose 'detail' from the swan. Metering from the swan might result in a reasonable image, but part of the swan is in shadow, part in bright light, so the swan is still likely to be too dark or too light depending on which part of the swan the meter reads from. Using manual settings is the best way to go, giving you complete control of the image, experience of similar lighting conditions would help, but even if you have no idea, starting with the aperture setting you want (to either ensure a sharp image, or a soft image), keeping the ISO at 100, and then altering the shutter speed to change the exposure will quickly enable you to select an exposure that provides what you want. Here I wanted the swan to be clear, but also for the 'sunbeams' to show clearly on the water. I used an aperture of f5.6 to give a fairly soft image with the zoom used, but to ensure the area of focus (the swan) is sharp. With an ISO of 100, this gave me a shutter speed of 1/1000s to let in just enough light to ensure the swan's body isn't too dark, but that the light areas aren't 'blown' totally, so you can still see the feather detail in the highlights. 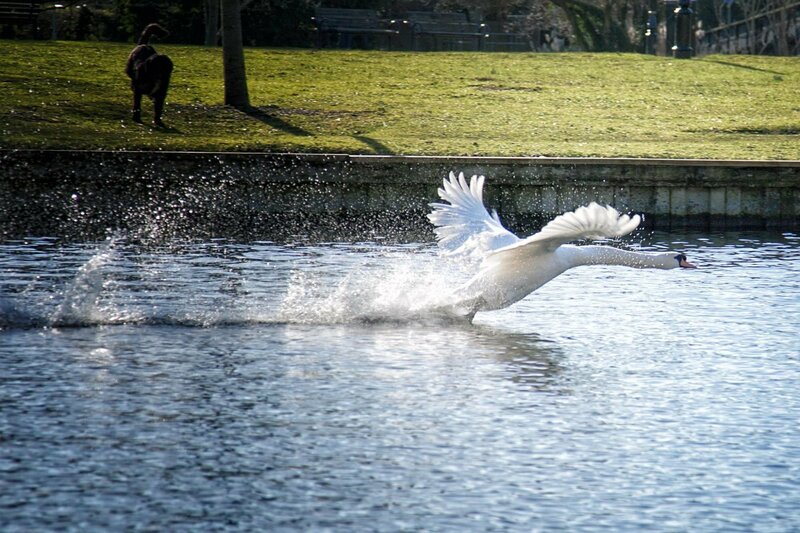 The swan then decided to take-off, so this was shot with the same settings, the fast shutter speed ensures that the 'action' is captured cleanly, freezing the moment, a slower shutter speed would start to see the wings blurring and losing the detail of the water splashes. The swan's body is still well exposed but you can see that the shadow areas of the scene are rather dark, the dog, in the shadow of the tree has lost all detail and colour, though as that isn't the focus of this image that's fine. Had the camera been in an auto-exposure mode though, the shadow's in the scene would have led to the image being too light as the camera attempted to evenly expose the scene, this would have lost detail in the swan as it became to bright and would also have lost the water splashes. So, the advice is, that where you have control over the camera's settings, get used to shooting entirely in 'manual' mode, where you individually set the aperture, the shutter speed and the ISO. Change each in turn, take a picture, and see how the change has affected the image, as you set a faster shutter speed, less light is let through to the sensor so the image will become darker, motion will also become 'frozen', with a slower shutter speed, more light is let in, the image will be lighter, and motion will become blurred. As you 'open' the aperture (a lower number as the setting) then more light is let in, the image will be lighter, and the image will be 'softer' as the depth of field is reduced. As you 'close' the aperture (a higher number as the setting), then less light is let in, the image will be darker, and the depth of field is increased resulting in more of the image being 'sharp'. Increasing ISO (a higher number) increases the sensitivity of the sensor to light so is the same as letting in more light, making the image brighter, but without changing either the aperture, or shutter speed. With practice, you will learn what settings/combinations are needed for different situations. If you want to capture fast motion, you need a fast shutter speed, which probably means you'll need a wider (lower) aperture, and/or a higher ISO setting. If you want a nice 'soft' image, you will need a wider (lower) aperture setting, which will mean a faster shutter speed with a low ISO setting and so on. Even many phones these days allow manual control of these settings in the same way. One other tip if your camera or phone allows, use the 'RAW" image setting rather than 'JPEG' - this means that you will need to use either the software supplied with your camera or phone or something like Lightroom or Photoshop to 'process' the RAW files to create a JPEG for printing or display on a website or social media, but doing so gives you the chance to adjust the brightness and shadow areas of the image, you can lighten shadow areas that are too dark, or darken highlight areas that are too bright, within a certain range, you can't lighten areas that are completely black, nor darken areas that are completely white, but 'RAW' files contain more information in terms of the range of dark to light, than a JPEG file does, so they better allow you to capture a true representation of the scene you are seeing.